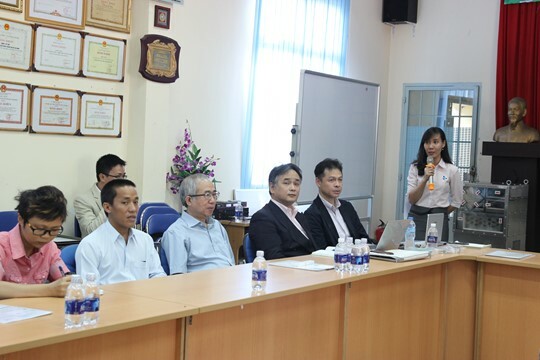 To share practical knowledge with the students, on Wednesday morning 11 March 2016 at B11 hall of Faculty of Mechanical Engineering at Ho Chi Minh City University of Technology, Seibu Giken Co. Ltd and Cty TNHH Ta Ha have organized the Workshop named “Application of new technology in energy recovery wheel and fan coil unit” and the Scholarship Ceremony “Overcoming Difficulty and Learning Well 2016“ for the students of CK12NH, CK13NH, CK14NH. 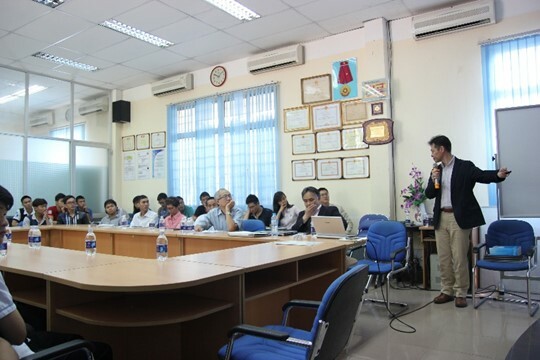 The Workshop and Ceremony honorably to have the Department of Heat and Refrigeration Engineering – Ho Chi Minh City University of Technology with the participation of Prof. – D.Sc. Lê Chí Hiệp – Head of Department; D.Sc. 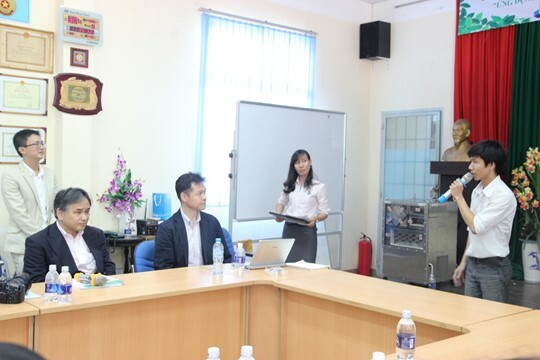 Hà Anh Tùng – Deputy Head of Department; M.E. 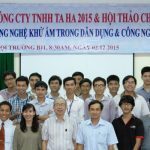 Nguyen Thi Minh Trinh – instructor and students attend. From Seibu Giken Co. Ltd (Japan), which attending by Mr. Yasutaka Ota – Senior Manager – Overseas Market and Mr. Eiji Tazuka – Manager – Overseas Market. 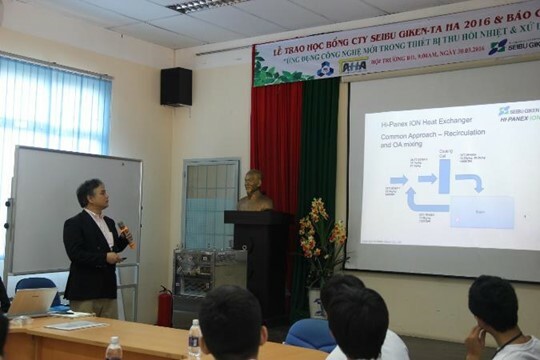 From Cty TNHH Ta Ha (Vietnam), which attending by Director Mr. Bui Huu Tai and management board and some staff in the company. 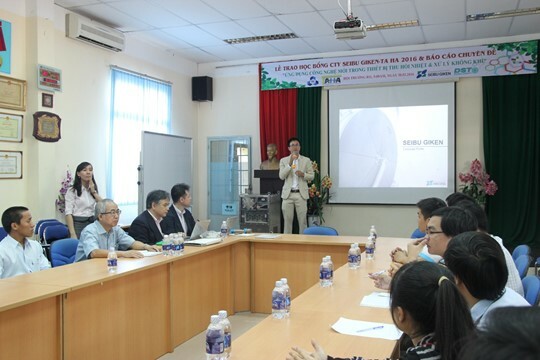 At the conference, the company has introduced to these student new technology – ION of energy recovery wheel, which has best performance in prevention of cross contamination and dehumidifying fan coil unit to achieve the requirements of production, as well as solutions to improve energy efficiency. After ending the conference, the scholarship ceremony has been coming next, Mr. Yasutaka Ota and Mr. Eiji Tazuka as well as Prof. – D.Sc. 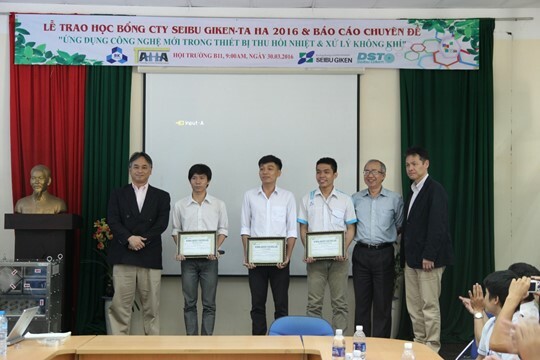 Lê Chí Hiệp have congratulated and awarded scholarships to students with good academic performance to overcome disadvantage. And On behalf of the students received scholarships, stud. 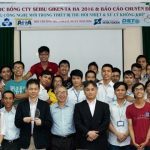 Huynh Lam was very grateful and honourable to receive the awards from Seibu Giken co. Ltd – Cty TNHH Ta Ha, and promise of trying to study well to deserve the scholarchip from the department and the sponsor. To end the workshop and ceremony, Prof. – D.Sc. 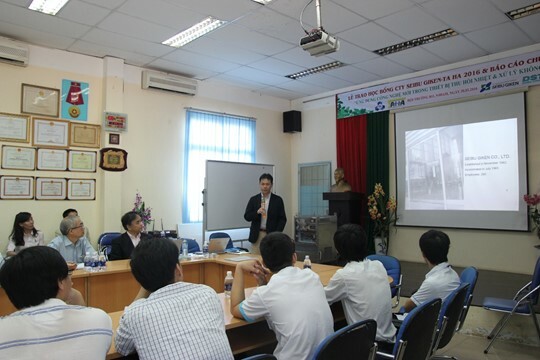 Lê Chí Hiệp “Thank you very much – these 2 companies has brought useful knowledge as well as a new orientation for the students”.